Mercedes-Benz’s basic PRE-SAFE® is a system which, at speeds above 30km/h, uses the driver’s inputs to steering, accelerator and brake, as well as dynamic data about the speed and rotation of the vehicle to determine whether or not emergency action is being taken, or if the car is out of control. If so, among other measures, the system takes the slack out of the seat belts using reversible tensioners and, if a side impact or roll-over is considered likely, it closes the electric windows and sunroof. PRE-SAFE® Brake is an autonomous emergency braking system which additionally uses radar sensors to help identify critical situations. At speeds between 30km/h and 200km/h, a distance some 200m ahead of the car is scanned for radar reflective obstacles. Some two and a half seconds before impact, the driver is warned of a potential danger. If, at that stage, the driver applies the brakes, the car automatically delivers the brake force needed to bring the car to a safe stop (if that is physically possible), regardless of the pressure applied by the driver. However, if the critical situation continues to develop and the driver does not react, the car applies partial braking around one and half seconds before the collision and tensions the seat belts in preparation for the impact. Finally, if PRE-SAFE® Brake determines that a collision cannot be avoided, the car applies maximum braking force to reduce the speed of the impact as much as possible. It is estimated that around 19 percent of all serious accidents in Germany are rear end collisions in longitudinal traffic. The main causes of such accidents are driver distraction or inattentiveness, and driver misperception where a driving situation is misjudged. PRE-SAFE® Brake operates at speeds between 30km/h and 200km/h. The system is therefore focussed on high speed accidents rather than those typical of urban driving, and the anticipated benefit is biased towards severe and fatal injuries. A decrease of 35 percent in the numbers of those who are at least severely injured is thought possible in cars equipped with PRE-SAFE® Brake. If all cars on the road were equipped with such a system, this would be equivalent to PRE-SAFE® Brake providing some measure of protection in accidents where, currently, around 6,500 people are severely or fatally injured in EU 27. PRE-SAFE® Brake can be switched off by the driver. If it switched off, it remains off until it is turned back on again and does not default to ‘on’ at the beginning of a new journey. 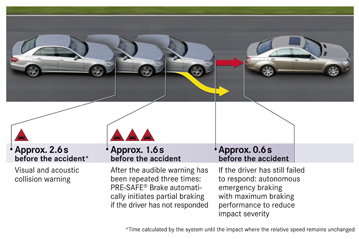 PRE-SAFE® Brake complements the basic PRE-SAFE® system to help predict when an accident is likely to happen. To do this, PRE-SAFE® Brake requires a sufficient radar reflectance of objects which the car is approaching. Also, the radar sensor needs a clear ‘view’ of the road in front and its efficiency is compromised by contamination such as snow, mud or leaves. In addition to the work done for the basic PRE-SAFE® system to determine the influence of seatbelt tension, extensive track testing was done to ensure that PRE-SAFE® Brake met targets for when warnings were given to the driver, and the points at which partial and full braking were applied. These track tests established the degree to which the impact speed was reduced in different accident scenarios against a simulated ‘target’ vehicle. Mercedes-Benz’s accident research group carefully monitors the real-world crash performance of its vehicles and has extensive data on the performance and effectiveness of its advanced safety features.